I was reminded of this song the other week whilst listening to a recording of Nightride from a few years back and Charles Nove played the Tracy Ullman version. A quick check on Google reveals that a session band called Reunion recorded the original back in 1974. Anyway it gave me the idea for an occasional series of posts on radio-related songs. There are a couple of uploads of Life is a Rock on YouTube, but this one has the most plays and the best video. Just try to sing along with this! The song also comes under the other category of “list songs”. Over on Wikipedia someone has gone to the trouble of listing all the references. Continuing this summer’s theme of travel here’s Motorway Manner. 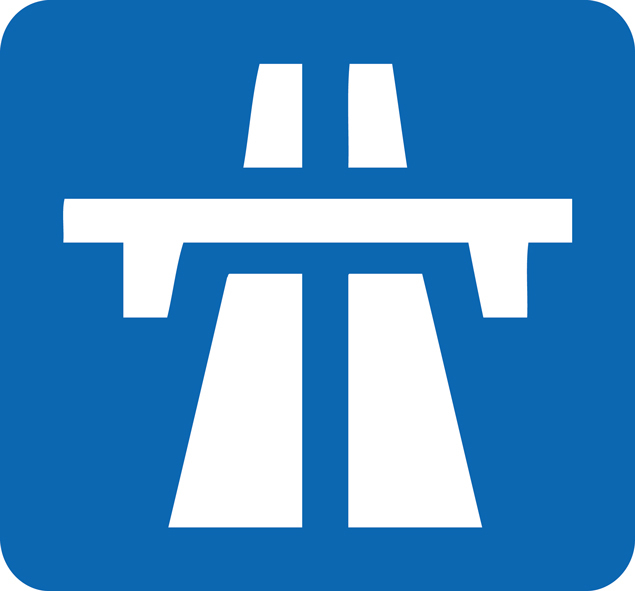 Journalist Ian Morton “talks to motorway users and assesses how the development of the network has affected lives and driving habits”. Broadcast on Radio 4 in 1980, the producer is David Rayvern-Allen. This is the fourth of six summer posts on travel and transport. 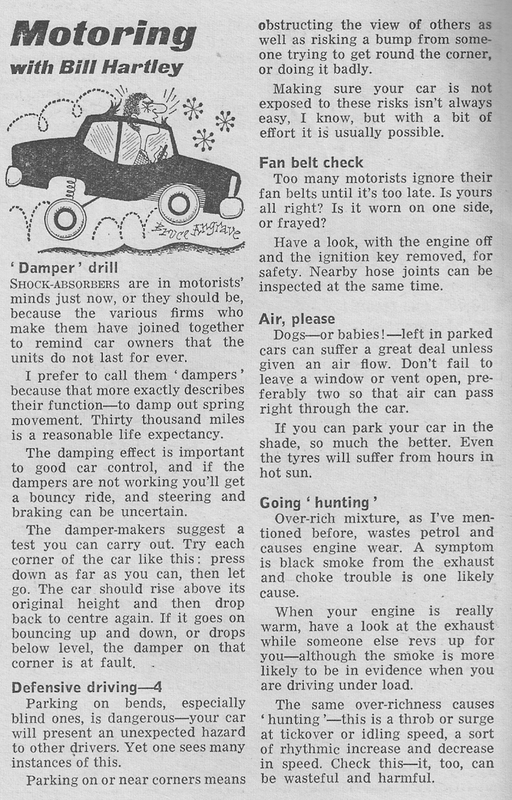 Long before Clarkson, May and Hammond’s escapades on Top Gear the country’s car advice came from a former engineer and member of the Institute of Advanced Motorists, Bill Hartley. 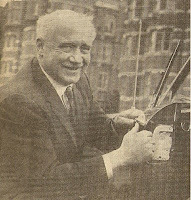 For sixteen years Bill Hartley was the main presenter of the BBC radio magazine programme Motoring and the Motorist, a “weekly survey of the world of motoring”. The programme, which by the mid-60s was attracting an audience of nearly one million, covered ordinary motoring topics, “the everyday problems we all have to face. We leave to others the competitive motoring sports, the cult of the veteran car and the specialized technical developments”. Motoring and the Motorist started on the Midland Home Service on 6 January 1953, initially produced by the grandly named Horace Saunders-Jacobs. It was transmitted nationally on Friday evenings on the Third Network from 11 October 1957 with, from about 1960, a Saturday repeat on the Home Service. 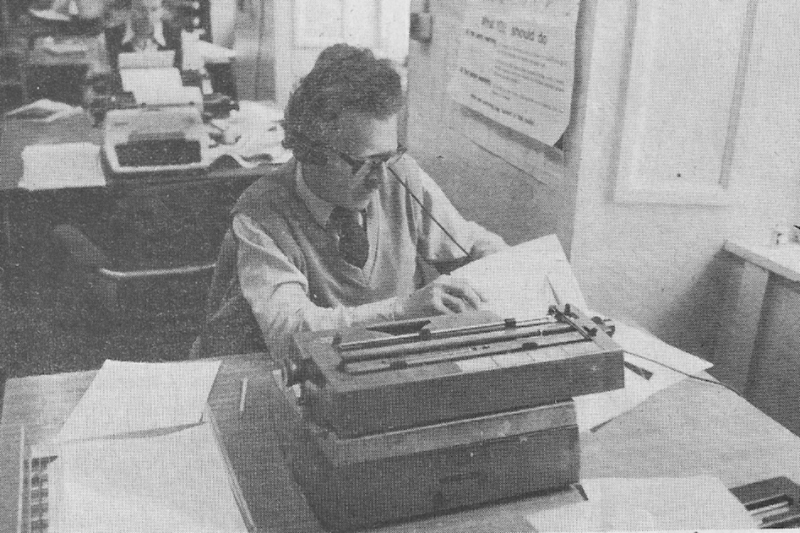 David Glencross produced the show for a while; he would eventually become a chief officer at the IBA/ITC. When David left Birmingham production duties fell to Jim Prestridge, a regular contributor to the series and a Midland region talks producer who, on the retirement of Bill Hartley in late 1969, became the main presenter for the remainder of its run. The series had its genesis in an earlier 1946 programme called How’s Your Car? The BBC’s Talks Department had wanted a series to help motorists keep their cars going at a time when there were few new models and garage services were limited. 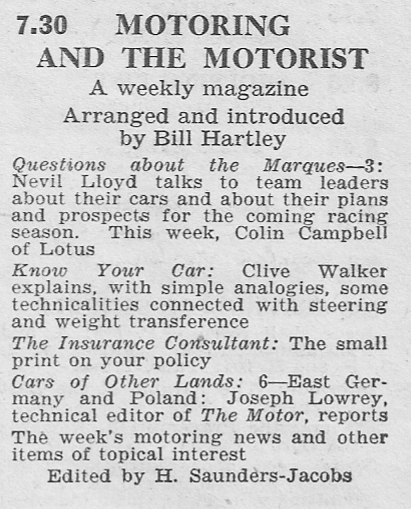 The idea had come from Bill Hartley and Bob Horsley, two motor industry experts but with no broadcasting experience. It was Bill Hartley’s idea to proceed with Motoring and the Motorist. He would edit and introduce each programme and interview many of the contributors Bill was born 29 August 1911 and educated at Dauntsey’s School, Wiltshire. He joined the Daimler Company at their London works in 1929 and stayed there 21 years mainly working in the experimental and development department. During the war he acted as the company’s Army liaison officer. Bill resigned from Daimler in 1950 to become a full-time motoring writer and broadcaster. 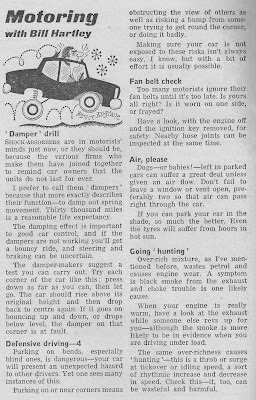 He wrote for the Illustrated London News, Practical Motorist, Reader’s Digest and the AA’s Drive magazine as well as authoring the Owner-Driver handbooks for many popular cars. He broadcast on motoring matters for the Central Office of Information, was a BBC motor racing commentator and, from 1957, one of the newsreaders on the Midland regional television service alongside Edmund Marshall and Anthony Raymont. Bill Hartley died in Devon on 19 February 1970. 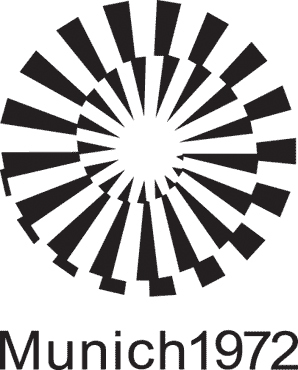 Motoring and the Motorist transferred to Radio 4 in 1967 and, following a major schedule shake-up across all the networks, moved to Sunday lunchtimes on 5 April 1970. Its final outing, with Jim Prestridge still presenting, was on 26 June 1977. In its place, though now moved to 18.30 on a Friday, was Going Places. Its brief was wider, looking at travel, transport policy and holidays and to prove the point its first presenter was ‘everyman’ Barry Norman. Barry was succeeded by Richard Hudson-Evans who, like Bill Hartley, had worked in the motor industry and wrote, and continues to write, for motoring journals. 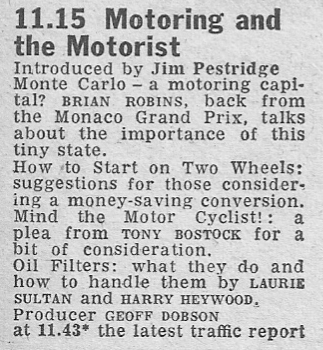 By now practical car advice was on offer on the BBC’s Top Gear television series, long before its subsequent boy racer incarnation. Like Motoring and the Motorist this originated from the BBC in Birmingham (though the programme had moved to London in 1963), presumably something to do with the proximity to the UK’s then car industry. Top Gear’s pedigree itself can be traced back to ITV’s Drive-In (1971-78) with Shaw Taylor, BBC2’s Wheelbase (1964-75) and, of course, to Motoring and the Motorist (1953-77). This is the third of six summer posts on travel and transport. Edit 19.11.12: Thank you to the Hartley family who got back to me about this post (see comments below). I am happy to correct the fact that Bill Hartley didn't retire in 1969 but, at the time of his death in 1970, was still working on the programme. The Munich Games of 1972 will forever be overshadowed by tragedy. But it’s also the Games that brought us sporting achievement of Mark Spitz, Lasse Verin, Olga Korbut.and, featured in this programme, Mary Peters. In this programme the much-missed and never-equalled broadcaster and commentator Peter Jones looks back at the highs and lows of the 1972 Olympics. The Munich Olympics are also recalled in tonight’s edition of the Radio 2 series The Ballads of the Games. 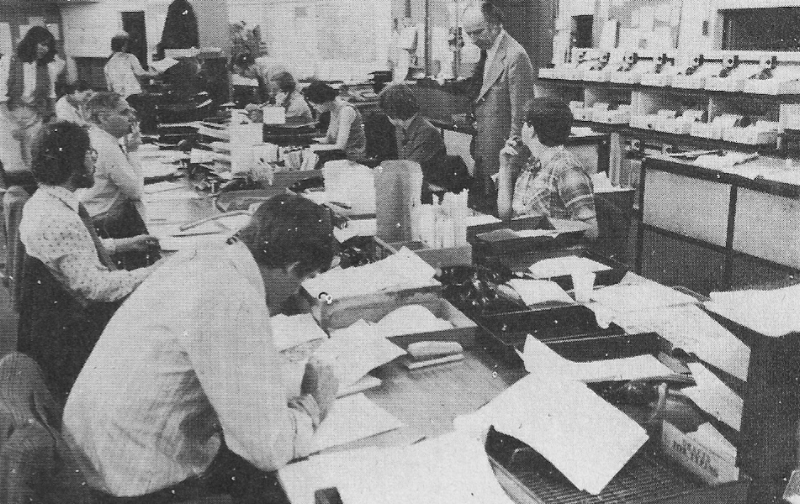 As the final BBC World Service news summary is broadcast from Bush House today here’s a look at the newsroom in 1979. Not a computer in sight. The words, extolling the virtues of the BBC’s news values, are provided by Senior Duty Editor J.M. 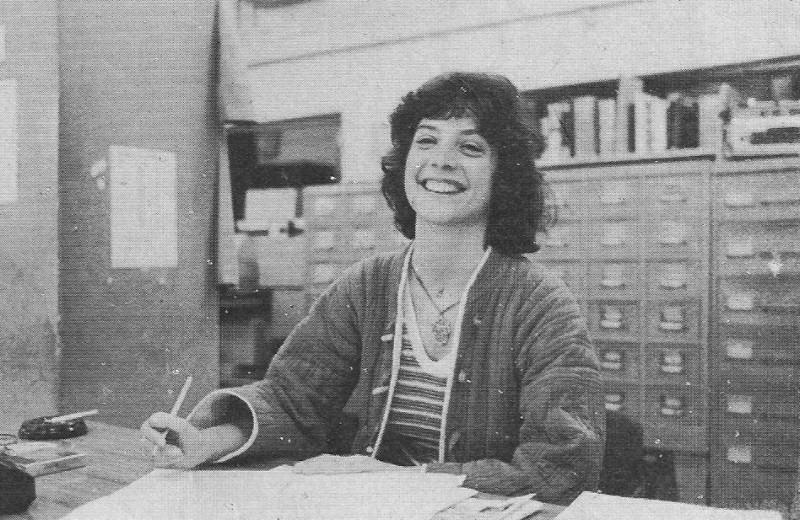 Laurie. News, in many ways, is like art. A declaration of war or the assassination of a world leader are simply obvious-like an old master or an exquisite jade carving. Most other world events, statements, international posturing or local crises are Giacometti figures-undoubtedly important but their appreciation or interest is a matter of personal choice bound up in our desires or tastes and our cultural and political environment. So providing a service of news for the entire world is often an unenviable task. One man’s accuracy is another’s bag of lies. One country’s misfortune often brings satisfaction to another. The appalling boredom that humanity is capable of feeling when told too often of, say, the death of thousands in an earthquake, eventually has to be swept away with injections of fresh events, the latest polemics, even more tragedy. So, perhaps it is just as well that the team of 100 men and women journalists who, day and night, in eight-hour shifts, man the Newsroom at Bush House in London, have between them more than 2,000 years of journalistic experience gained in most corners of the world. The technology and methods used to gather then produce the news bulletins for the BBC World Service could fill a book. The vast network of correspondents-the million of words that flow in daily, the deadlines, the studios, the transmitters. Without all these we would be lost. However, the important thing is what part of this enormous volume of information should be broadcast. The need for accuracy is paramount. Other journalists on newspapers often have the freedom to accept just one source for a story and perhaps even a doubtful one at that. The BBC does not allow itself this freedom. Unless it is a staff correspondent reporting, then at least two trusted sources are the rule. And the frustration of waiting for a second source to verify an important story has to be experienced to be believed. We know, too, that every time a story is broadcast the people actually involved may well be listening. They will know exactly what has happened-the newsroom will have, in many cases, perhaps only delayed accounts of it. It is little comfort to sit in an area that has been torn by war to hear the BBC World Service tell you that there is a lull in the fighting while outside your window shells are raining down. But perhaps our greatest test is the enormously high standard set for us by the men who made the World Service what it is. This in a world where the unvarnished truth sounds vile to the ear turned by lashings of bias or dull to the ear doped by increasing dosages of what the trade calls “jazzed up” material. So it isn’t the high technology of the machinery we use to get the facts to us, then to you, that is the important thing about the news we bring you. It is the men and women who check and double check, write and re-write, consider and worry, then finally decide to go ahead and broadcast what they honestly believe to be the nearest to the truth that they can get. They are the people who make our output what we modestly like to think of as the finest radio news service in the world. In January I wrote a short history of radio travel news bulletins. 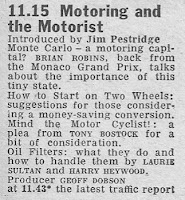 I’ve since come across this account of the formation of the BBC’s Motoring Unit from Jim Pestridge, at the time producer of the series Motoring and the Motorist. It was first published in 1965. 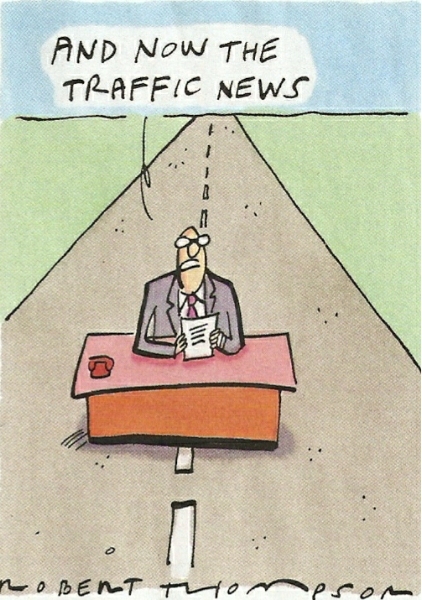 One of the jobs of the BBC Motoring Unit is to provide weekend road traffic reports. During the summers of 1963 and 1964, these reports were broadcast two or three times on each Friday, Saturday and Sunday, with longer periods at the Bank Holidays. For the rest of the year, there was a full reports on Sundays for the week ahead, with brief reports in Friday Roundabout and Motoring and the Motorist. To set up the organization for these broadcasts was no easy matter. First, an experiment was carried out over the 1962 August Bank Holiday, using information from the police in four important centres. As this was not as comprehensive as we wished, Robin Richards  was commissioned by the BBC and the Ministry of Transport to investigate the possibility of a regular series and to find the best sources of information. It was on this latter point that we had some surprises, for no single organisation had a complete picture of the country’s traffic problems. The police forces were obviously the best informed, but each force worked independently, being concerned only with its own area. Local authorities knew about road works in their areas, though some admitted that work by public utilities sometimes started before they had been informed. The motoring organizations relied on police information and reports from their road patrols, and the Ministry of Transport divisional road engineers were only concerned with trunk roads and Ministry ‘schemes’. All this information concerns ‘foreseeable’ problems, such as road works, bottlenecks, sporting meetings, events where crowds would gather, and any necessary diversions. The information about ‘unforeseeable’ happenings would have to come mainly from the police and the patrols of the motoring organizations. This would cover such things as accidents, fires, burst water mains, floods and the re-routing of traffic due to any unforeseen cause. Discussions were held with all concerned and the Conference of Chief Constables, on behalf of all police forces, agreed to co-operate in the series of broadcasts planned for the summer of 1963. The motoring organizations willingly shared all their information and the Home Office and the Ministry of Transport approved the plans. To cover one other hazard of the roads, the Meteorological Office gave us help by arranging for their Weather Centres to report serious changes in the weather conditions which could affect motoring. On our part, it was decided to restrict the coverage to England, Scotland and Wales, because the traffic problems of Northern Ireland were not so serious, despite a length of motorway and the parking situation in the city of Belfast. 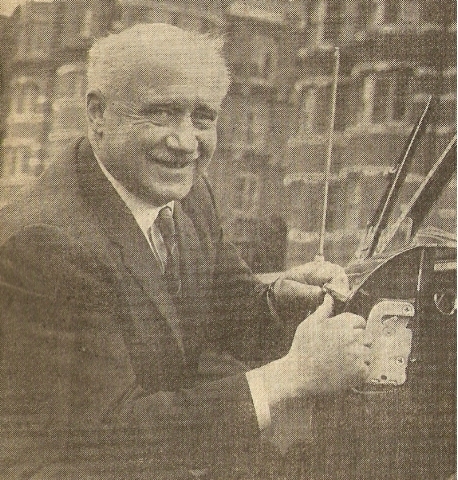 By Easter, 1963, the Motoring Unit had an office and studio in Broadcasting House and the reigning Minister of Transport, Mr Ernest Marples, came along to launch the service and to give us just the encouragement we needed. 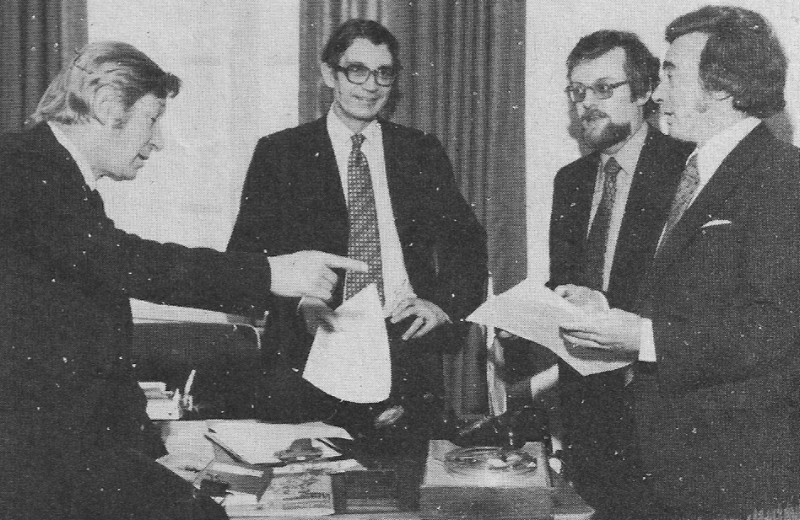 Three of us took it in turns to prepare and broadcast the traffic reports at weekends – Robin Richards, who undertook the original survey, Bill Hartley  and myself. The first summer’s operations were successful and many listeners wrote with praise or useful criticism; the police, too, thought it had been a useful service, if only to make motorists more aware of the problems on the roads. During the winter that followed, a reduced number of reports at weekends kept the service going until the summer of 1964. 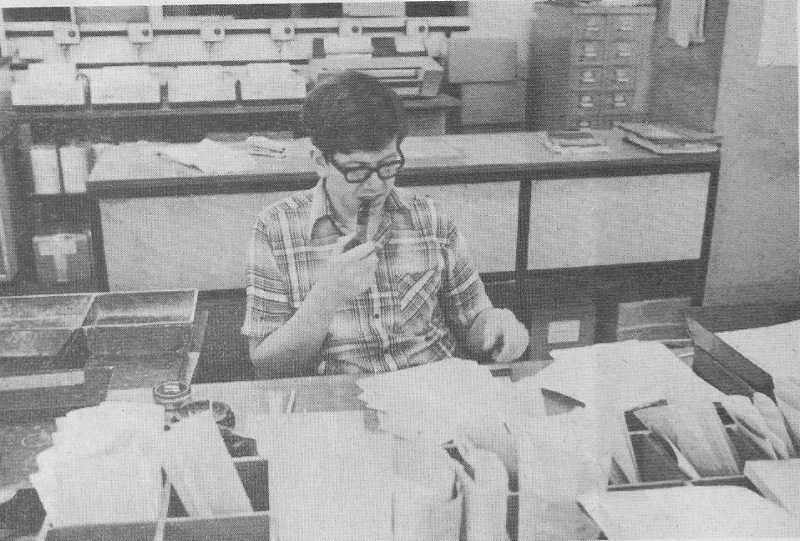 Previously most of the broadcasts had been in the Light Programme, but now they were also heard in the Home Services, giving specialised regional information. The details for 1965 are at present being worked out, and it will be our intention to continue the service with a number of short, regular reports at weekends. The times of these will appear in the Radio Times. The best way to use the service is to have a set of maps covering your route, then to listen to as many reports as possible – especially the Sunday morning reports in the Light Programme which covers the main congestion spots throughout the country. Quite often, it is possible to select a route avoiding any congestion, and though it might be a few miles longer, at least it will avoid the frustration of a lengthy queue. This country is still big enough to have some quiet by-roads just suited for unhurried holiday trips – and what pleasure there is in finding again an open road. On the road it is well worth listening to the traffic reports because often there is something unforeseen to report, together with the latest news of congestion gathered from the police information rooms just prior to the transmission. In addition, if something really serious happens, we have an opportunity to broadcast it as a ‘flash’ of information at a programme junction or other suitable break. 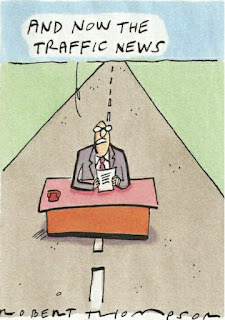 Of course, it is impossible to mention every traffic jam and some spots are so well known that repetition would be tedious. So, if we don’t mention your own special hold-up, or if the information is a little late or out-of-date, remember we are looking at the country as a whole. The excellent service we get from the police may not be fast enough to cope with the speed at which congestion builds up on our crowded roads. Perhaps, one day, we may have our own helicopters and closed-circuit television – and a separate channel on your radio! Well Jim wasn't far wrong. 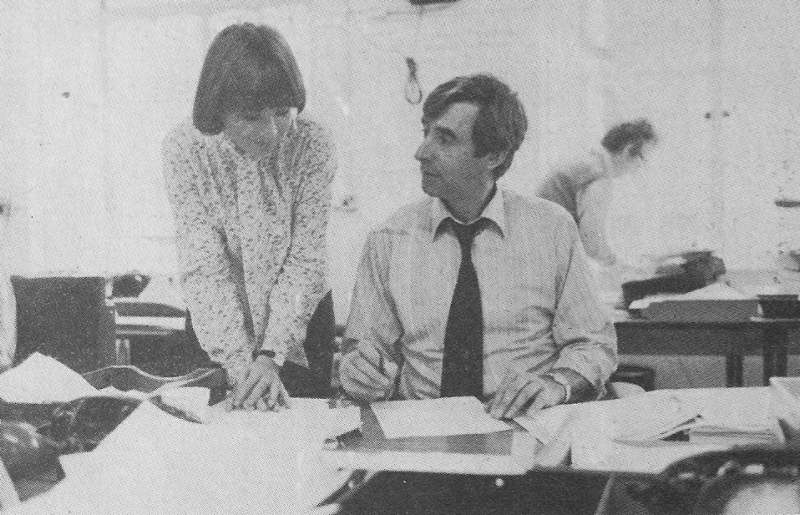 By 1987 the BBC was launching the Radio Data System (RDS) and the provision of travel information came under the province of the Travel Centre based in the first floor extension of Broadcasting House managed by former radio producer Irene Mallis. In the early days of RDS, AA Roadwatch had already cornered much of the broadcast travel news market where it was not being provided by local stations themselves, but the Travel Centre had permanent lines to BBC GLR (at weekends mainly, where Chris Evans had a Saturday morning show), BBC Radio Kent (Pat Marsh, Barbara Sturgeon, etc. ), BBC Essex (Liz Mullen among others) and BBC Radio Bedfordshire (Mo Dutta, Jamie Crick and Alan Dedicoat among the regulars there then) and whoever was on duty at Broadcasting House monitored and broadcast their local travel news live, chatting to the drivetime presenters morning and afternoon, as well as popping up hourly on the newly-arrived BBC Radio 5. We also turned up on BBC Radio Gloucestershire and BBC Radio Bristol, usually around 5.30 a.m. Whenever the local station faded us up, the RDS signal was triggered. We even had a travel flash on Radio 3 one time when traffic became gridlocked in the area of the Royal Albert Hall and members of the orchestra were delayed as well as the audience, so the concert start was delayed considerably! This is the second of six summer posts on travel and transport. Robin Richards had been a motor dealer before becoming the BBC’s motor sport commentator. 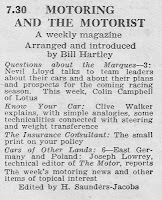 Bill Hartley was a motoring journalist and broadcaster who presented Motoring and the Motorist for sixteen years. Irene Mallis was on the launch team at BBC Radio Devon and was producer and editor of the Radio 4 travel series Going Places. She is now a media consultant. 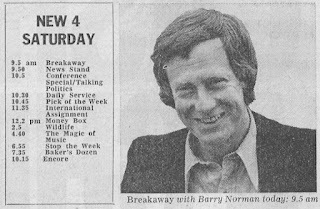 Breakaway was one of Radio 4’s consumer based shows that came along in the late 1970s alongside Going Places, The Food Programme and Money Box, which started on the same day. The first programme in September 1979 presented by radio ‘everyman’ Barry Norman promised a “breakaway from routine” with Sir Ralph Richardson on motorcycling with a Spanish parrot, Wynford Vaughan-Thomas on the postcards of Donald McGill and Richard Vaughan with the Sealed Knot Society. 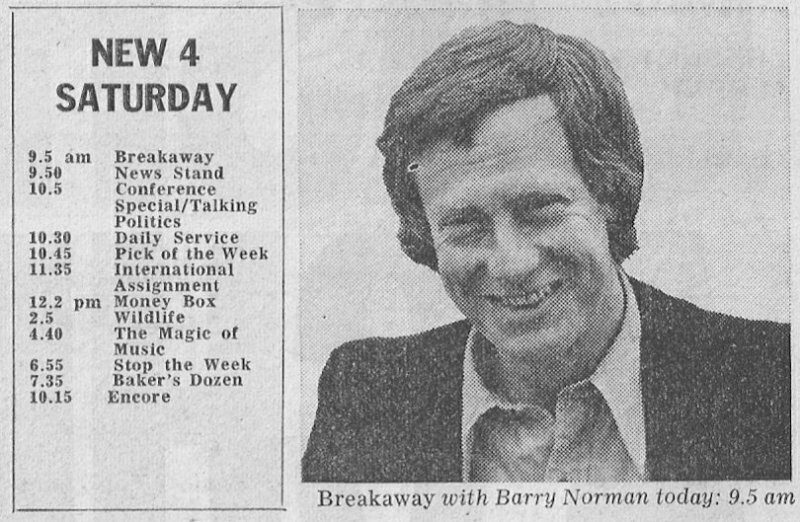 Eventually Breakaway would confine itself to holiday reports, travel tips and the like and for a decade (1980-1990) it was hosted by Bernard Falk, best known for his reporting on BBC1’s Nationwide. When producer Jenny Mallinson Duff left for Channel 4’s travel series Travelog she took Bernard with her. This ‘conflict of interest’ led to him being dropped from the Radio 4 show. Subsequent presenters included Julian Pettifer, Ken Bruce, Anne Gregg, Bill Oddie, Eddie Mair, Simon Parkes and finally Pete McCarthy. For many years the show, always broadcast on a Saturday morning, was sandwiched between Sport on 4 and Loose Ends. It was finally swept aside as part of controller James Boyle’s schedule changes in April 1998. But it’s back to July 1987 for this American Independence Day special in which Anthony Denselow visits Boston and Martin Muncaster goes to Kansas. 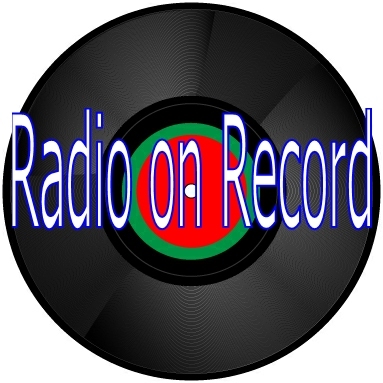 Alongside Bernard Falk in this abbreviated recording are Susan Marling and Nigel Coombs. This is the first of six summer posts on travel and transport.